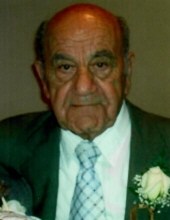 Ernest J. Petrangelo, 92, resident Pascoag and formerly of West Warwick, passed away Monday, December 3, 2018 in Pine Grove Health Center, Pascoag. He was the loving husband of Claire E. (Lemerick) Petrangelo, whom he married October 31, 1953. Born in Warwick, he was the son of the late Julian and Mary (Fecente) Petrangelo. Ernest worked in construction, retiring as Construction Foreman for Kent Foundation. Besides his wife, he is survived by a son Ernest J. Petrangelo Jr. of West Warwick; a daughter Barbara Colozzo of Pascoag and three sisters: Adeline DeCarlo of NY, Yolanda Codiero of Providence and Susan Cambio of West Warwick. He was the brother of the late Dino, Anthony, Tommy and Louie Petrangelo, Tillie Petrangelo and Carmella Cantone. A Mass of Christian Burial will be held, Friday, December 7, 2018 at 11 AM in St. Joseph's Church, 183 Sayles Ave. Pascoag. Burial will follow in St. Joseph's Cemetery, 959 Nooseneck Hill Rd, West Greenwich. Calling hours will be Friday prior to the Mass from 9AM to 10:30AM in the Boucher Funeral Home, 272 Sayles Ave. Pascoag. In lieu of flowers, donations in his name may be made to Hope Hospice & Palliative Care RI, 1085 North Main Street, Providence, RI 02904. To send flowers or a remembrance gift to the family of Ernest J. Petrangelo, please visit our Tribute Store. "Email Address" would like to share the life celebration of Ernest J. Petrangelo. Click on the "link" to go to share a favorite memory or leave a condolence message for the family.